Rutherford B. Hayes (1822-1893) was the Republican 19th President of the United States, 1877-1881. He was nominated because Ohio was a close and large state state. Previously he served one term as governor of Ohio, service in Congress as a Radical Republican who supported Reconstruction. He gained local fame as a general in the Civil War. He was a relatively conservative chief executive who left little mark, but exemplified the honest, hard-working party leadership of the Third Party System. He was the beneficiary of the "Compromise of 1877" that ended opposition to his election, and ended Reconstruction. Hayes was a Victorian gentleman from a Yankee family that had resettled in Ohio. His father died befoire he was born, but his rich bachelor uncle Sardis Birchard took him under wing. He graduated from the local school, Kenyon College, and was the first president to attend Harvard Law School (Ll.B. 1845). He became a leading lawyer in Cincinnati, and inherited wealth from his uncle. His diary plainly reveals the ambivalence he felt when his political ambition clashed with his strict sense of morality, which told him that a man might gladly accept high office but should not actively seek it. Hayes had fewer popular votes than his opponent Samuel J. Tilden, and so entered the White House with his title clouded by the disputed election of 1876. 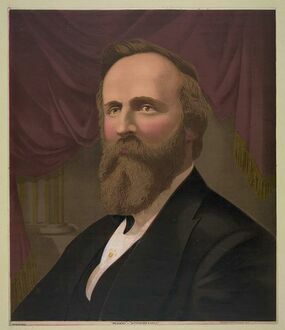 Opponents called him "His Fraudulency" and "Rutherfraud B. Hayes," but soon he began to reassert the authority of the presidency and the sarcasm faded away. Hayes promoted Civil Service Reform to reduce the corruption inherent in the linkage between vote-seeking and office-holding. He named well-known reformers in high offices, and, ordering the last troops out of South Carolina and Louisiana, ended Reconstruction. He hoped to revive the Republican party in the South by persuading business-oriented conservatives (most of them ex-Whigs) to join a national party that would support their economic interests more effectively than the Democrats did. He failed because the South was polarized on race. Committed to the gold standard--the only basis, Hayes thought, of a sound currency--in 1878 he vetoed the Bland-Allison Silver Purchase bill, which called for the partial coinage of silver, but Congress passed it over his veto. He and First Lady Lucy Webb Hayes refused to serve alcoholic beverages, even at state functions; they called her "Lemonade Lucy." This page was last modified 02:12, 27 May 2013.